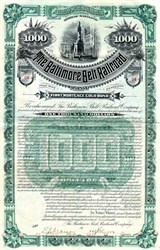 Beautiful certificate #24 from the Baltimore Belt Railroad Company issued in 1890. 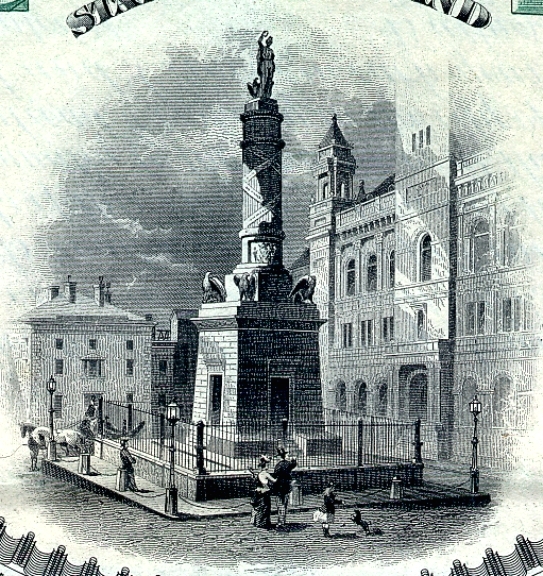 This historic document was printed by the Homer Lee Banknote Company and has an ornate border around it with a vignette of a statue in the middle of a town. This item has been hand signed by the Company�s President, and Secretary, and is over 121 years old. The Baltimore Belt Line was constructed by the Baltimore and Ohio Railroad (B&O) in the 1890s to connect the railroad's newly constructed line to New York City with the rest of the railroad at Baltimore, Maryland. It included the Howard Street Tunnel, the Mount Royal Station and the first mainline railroad electrification in the United States. The B&O's original connection to New York in Baltimore was through surface street transfers to the Philadelphia, Wilmington and Baltimore Railroad (PW&B), pulled by horses along Pratt Street between the B&O's Camden Station and the PW&B's President Street Station. In 1884, the PW&B was purchased by the Pennsylvania Railroad (PRR), cutting off the connection. The B&O built a new line to connect to the Philadelphia and Reading Railroad, in turn connecting with the Central Railroad of New Jersey for B&O's New York service. The combination also provided a connection to the Staten Island Railway, which served as the terminal switching company for the B&O's New York freight service. Connecting the new line to the rest of the system was a considerable engineering challenge. A new surface line across the center of town was politically impossible and prohibitively expensive; building around the outskirts of town would have required massive regrading and bridging, as the terrain is extremely hilly and the line would cut across every watershed flowing into the harbor. As a temporary expedient, traffic was handled through Baltimore on carfloats, but it was clear that a direct connection would have to be built. Mount Royal Station (in 1961)The route chosen started from the existing end of track at Camden station, at the west end of the Inner Harbor. A tunnel was constructed directly under Howard Street, heading north until just before it crossed the existing PRR line. At the north portal of the tunnel, Mount Royal Station was constructed. The track then curved around to the east, passed through six other (much shorter) tunnels, continued across town, finally heading southeast to meet the already constructed line just north of the Canton neighborhood. The cost of construction drove the railroad into bankruptcy shortly after the line opened. The Howard Street Tunnel, originally a 1.4-mile (2.3 km) long tunnel under Howard Street in downtown Baltimore, took four and a half years to build (1890-95) and was the longest tunnel on the B&O's system. The tunnel is brick-lined with iron-arched centerings. At the time of completion it was considered innovative for its use of electicity for illumination and powering of locomotives. Inside the tunnel, there was an underground platform for trains serving Camden Station. The Howard Street Tunnel is listed on the National Register of Historic Places. Interior of the B&O's powerhouse in 1910, supplying 675 volts DC to the Baltimore Belt LineBy this time the Pennsylvania Railroad line through Baltimore and south had been in operation for twenty years. Due to the built-up nature of the area traversed and the hilly terrain, much of its line through town was in tunnels, which posed severe ventilation problems. Large chimneys were constructed above the Pennsylvania line in a not entirely successful attempt to disperse the fumes from the coal-fired locomotives. However by 1890 electric locomotion was beginning to appear possible, and in 1892 the B&O thus contracted with General Electric (GE) for electric locomotives, powerhouse equipment, and the electricity distribution system. These were delivered beginning in 1895, and the first train pulled by an electric locomotive operated through the Howard Street Tunnel on June 27, 1895. Throughout much of its history until the end of passenger trains in 1958, the line had relatively low passenger traffic, averaging six daily New York�Washington trains each way. Freight traffic was also limited by the scarcity of online industry east of Baltimore and B&O's lack of a connection across the Potomac River at Washington, D. C., to the southern railroads. The massive Pennsylvania main line carried most traffic to the northeast. In 1976, however, this line became Amtrak's Northeast Corridor (NEC), and its role as a freight line became relatively minor. The 1987 accident at Chase, Maryland involving a Conrail locomotive led to further reductions in freight traffic on the NEC. The Belt Line (now operated by CSX Transportation (CSXT) is therefore a key link in what has now become the principal rail freight line from Baltimore to Philadelphia and beyond. See Baltimore Terminal Subdivision. On July 18, 2001, a 60-car CSXT freight derailed in the Howard Street Tunnel, sparking a fire that burned for six days and blocked traffic for much longer. The Howard Street Tunnel fire called attention to the Belt Line, both as a risk to the surrounding structures and as a link in rail traffic. CSXT has implemented various improvements to increase the integrity of the link, but is limited by the shallow depth of the bore (only three feet below the surface at the south end) and the instability of the surrounding soil.